The global economic pivot towards China took a significant step earlier this year, when a swathe of leading Western economies clambered over one another to sign up to a development bank set up by the country. The Asian Infrastructure Investment Bank (AIIB) has been launched by the Chinese Government, ostensibly as a way of helping finance major infrastructure projects throughout Asia, but seen by some as a challenge to US dominance within other global financial bodies. Proposed initially in late 2013, the AIIB came about because of the Chinese Government’s apparent frustrations with its lack of input at the World Bank and International Monetary Fund (IMF), both of which are dominated by the US and other western economies. China has also long been seen as keen to establish a rival to the existing Asian Development Bank (ADB) that was set up in 1966 and is largely dominated by Japan. The idea for the bank has been discussed for a number of years, in particular after a 2010 ADB report that called for $8trn worth of infrastructure projects in the region to be built by 2020, in order to speed up economic development. The Chinese Government continued to discuss the potential bank throughout last year, with a proposal in June 2014 for India to be a founding partner and for the initial starting capital to be $100bn. 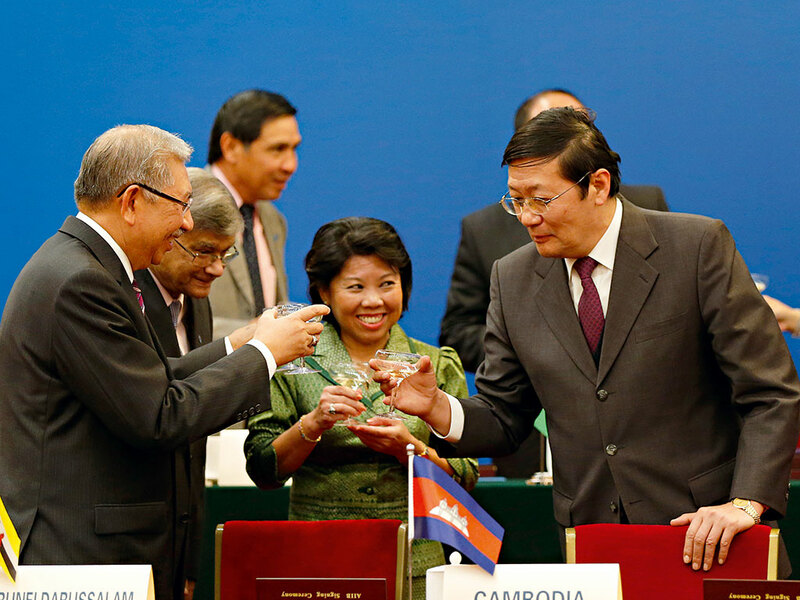 Formally created in Beijing in October 2014, an initial 21 countries in the region signed the founding agreement. Further countries from across the world have now signed up to help fund infrastructure projects in Asia and spur development across the region (notably, the bank’s definition of Asia is wider than many assumed, with the Middle East and Russia coming under the umbrella of the region). Early signatories include many of the region’s leading economies, including India, Australia, Malaysia, Thailand, Russia, Iran, Qatar, Saudi Arabia, Turkey, Pakistan and Indonesia. However, many further-afield economies have also been quick to join the bank, with the UK, Germany, France and Spain leading the European contingent, alongside others including Brazil and South Africa. While many of the world’s most prominent economies have been eager to get involved in the new bank, whether to curry favour with China or otherwise, others have been less welcoming. When the UK announced it would be the first major European country to join the bank, a source in the US Government warned that it was concerned about how the UK had not consulted the US, and that there was a “trend toward constant accommodation of China”, which was not how emerging superpowers should be treated. Japan has also been wary of the new rival to the ADB, which also invests in a wide range of infrastructure projects in the region. Japan plays a leading role in the ADB and has so far refused to join the AIIB. How these two infrastructure development banks will compete for business is likely to become a prominent issue in the coming months and years. In May, Japan’s Finance Minister Taro Aso announced the country would be increasing its investment in the ADB at the group’s annual meeting, this year held in Baku, Azerbaijan. According to Kyodo News, Aso said: “We want to encourage infrastructure investment that will contribute to high-quality economic growth in Asia.” Such a move is likely to be seen as a response to the launch of the AIIB, and an effort to maintain Japan’s pre-eminence in development investment across Asia. 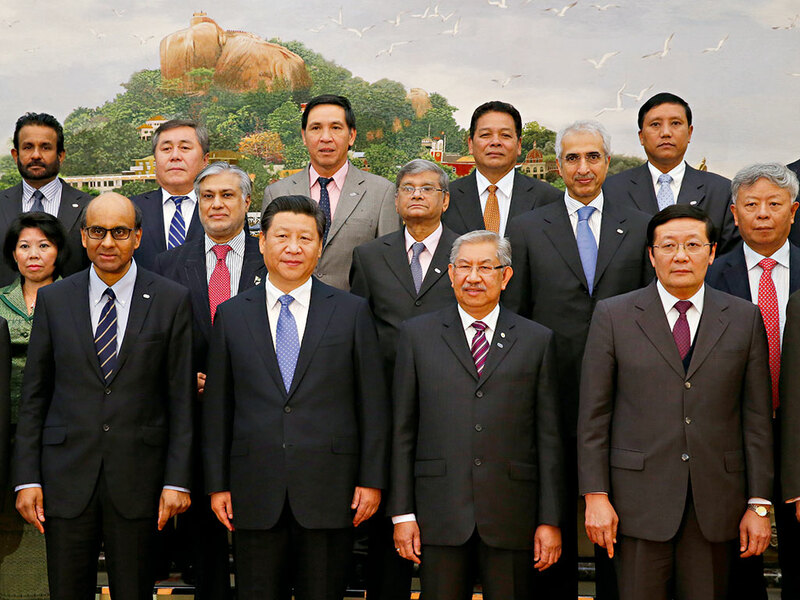 The consequences of the AIIB for the global economy are likely to be significant. With Russia’s position on the global stage becoming increasingly remote, it has frantically sought to align itself with China. The strengthened ties between the two countries have led to Russia gaining status within the AIIB as an ‘Asian’ member, according to reports. This would mean it gains larger voting rights than non-Asian members like Germany, the UK and France – coincidentally countries that Russia has clashed with over the ongoing instability in Ukraine. The balance of influence within the AIIB is inevitably going to be skewed towards Asian economies, and it is thought that the Asian members of the bank – including Russia – will account for somewhere around 75 percent of voting rights. The dramatic way in which China’s economy has been transformed thanks to such heavy infrastructure spending has led many other Asian economies to look on enviously, hoping to get a similar lift themselves. Such a focused development bank may go some way to answering their prayers, providing a real boost to Asian economies looking to grow. Its impact will obviously be greatest in China, which will cement its place as a major player in global development decision-making. “Of course it’s positive for China and the region at the same time, due to its rating. The demand on the Chinese yuan as a strong currency is likely to increase over time, which will also increase the yuan rating globally”, said Al Hammoury. Whether it represents a major shift away from US control over global policy, however, remains to be seen.